National Trail, and interviews with experts and local folk. comprehensive filmed travel guide you will find of this Outstanding Area of Natural Beauty. Perfect for planning your visit, or top armchair entertainment. Includes six walking trails. *Lower Slaughter, Bourton-on-the-Water, The Cotswold Motoring Museum. * Historic villages of Burford and Northleach plus the AONB Centre & Mechanical Music Museum. *Roman Cirencester then exquisite Bibury and a Jubilee Walking trail. *The lovely gardens of Hidcote & Kiftsgate in the north, plus Chipping Campden & Broadway. *Robert Dover's Original Olimpick Games! *A ride on the Goucestershire & Warwickshire Steam Railway + Winchcombe & Sudeley Castle. *Cheltenham walking and shopping tour. Cheese Rolling at Coopers Hill, Historic Painswick and district. Lacock, Castle Combe plus Westonbirt Arboretum and BATH city trail! the North, East and Central parts. Visiting 3 delightful market towns. Dave and I ride out in my little blue Mazda to Moreton-in- Marsh with a vibrant market of over 200 stalls. Next on our Northeastern tour is an atmospheric stop at the mysterious Rollright Stones. Arriving at Chipping Norton we find its lovely almshouses and church are completely hidden from view of its bustling main street. The third town of Stow-on-the-Wold is must- stop for most Cotswold travellers. Its ancient and tranquil marketplace belies a rich and also turbulent past. After a quick lesson in dry stone-walling, the end of the chapter features a classic Footloose walking trail across fields and meadows to idyllic Lower Slaughter and the old mill. We finish at the family resort of Bourton-on-the-Water with time to take in a visit to the nostalgic Cotswold Motoring Museum. We discover the historic medieval town of Burford, an important stop for travellers throughout the ages, often known as the "Gateway to the Cotswolds". Next is Northleach, where we drop in at the Area of Outstanding Natural Beauty Visitor Centre (a former House of Correction!). After a chat and a look around the cells with representative Nicola Greaves, Dave and I then walk into the old wool town of Northleach. We are treated to wonderful instrumental demonstrations by Keith Harding in his Mechanical Music Museum... A trip down the Fosse Way to see Roman Cirencester culminates in the largest Roman Amphitheatre in Britain. The chapter ends with a visit to exquisite Bibury to see the famous Arlington Row cottages, followed by a summer walk in the beautiful surrounding countryside. Starts at the lovely gardens of Hidcote and Kiftsgate with interviews from Mike Beeston and Jonathan Chambers. Both features were shot in high summer when the "Arts and Crafts" gardens were in full bloom. Next is a visit to lovely and historic Chipping Campden and its quirky "Original Cotswold Olimpick Games". Here Dave and I experience Morris-dancing and the shin-kicking finals! Next is a drive to the artists' town of Broadway. Nestling at the foot of the Cotswold escarpment it possesses some of the deepest coloured stone in the region. 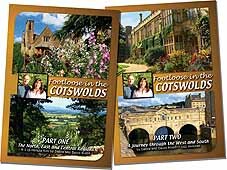 The chapter is rounded off with a bucolic walking trail on the Cotswold Way & Winchcombe Way through the lovely villages of Stanton & Stanway and the rolling hills of the Cotswolds. the West and Southern parts. Starts with a look at the magnificent steam locomotives at Toddington station. In an interview with GWR representative, Colin Fewell discusses the history and operations of this incredibly well-restored line. After a tour around the cab of the Prairie tank engine, Dave and I travel by rail to historic Winchcombe, pulled by the magnificent engine 8254. After a look around the interesting medieval town, we take a 5-mile scenic hike on the Cotswold Way to Belas Knap, the Neolithic burial chamber. Having completed the round trail, we then explore Sudeley Castle... this historic stately home has so much to see for the visitor: wonderful gardens, history displays, an aviary, and of course, tea-rooms. The chapter finishes with the conclusion of our GWR steam rail journey to Cheltenham Race Course. Cheltenham's streets and floral parks make for an elegant and colourful walking tour round this lovely old town. We stop at Huffkins for a cream tea and a chat with Oliver the waiter. Dave and I then join the Cotswold Way along the dramatic escarpment above the town for five miles. From the viewpoint at Crickley Hill, many sights across Gloucester into Wales can be taken in. Further on at the end of the day's walk, the strictly unofficial and dangerous Coopers Hill Cheese Rolling Event provides hilarity for all nations, on this steep Cotswold ridge. The chapter ends with a walking tour around lovely and historic Painswick, followed by the Rococo Gardens and Laurie Lee's little village of Slad. Dave and I continue our motoring journey in my trusty blue Mazda, visiting the ancient rival towns of Malmesbury, including its Abbey; and Tetbury, with its two churches and an annual Woolsack Race event: Competing local teams are joined by a TV team from South Korea, of all places! She drives on to enjoy the vibrant Autumn colour of the Japanese maples at nearby Westonbirt Arboretum. This is followed by a visit to the "Old English" film locations of Lacock, its Abbey & Castle Combe... Over several decades many feature films have been made at these little villages. After an interview with AONB representative Nicola Greaves, the chapter ends with a spectacular walk on the last five miles of the Cotswold Way - from Landsdown Racecourse down into Bath, passing by the Royal Crescent. Part two is concluded with an historic walking trail around this magnificent Georgian city. 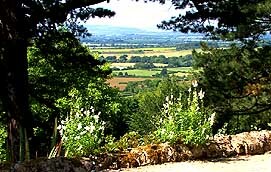 http://www.cotswolds.info detailed and comprehensive website for the whole area. Cotswolds Area of Outstanding Natural Beauty lots of information on the Cotswolds countryside and walks. The Cotswold Way the scenic and often strenuous long distance National Trail ~ 102 miles!